MADRID (AFP) – Chilling images published in the Spanish media on Monday show men in a terror cell preparing explosives ahead of last year’s jihadist attacks in Barcelona and a nearby seaside resort that killed 16 people…. One of the men preparing the explosives is Younes Abouyaaqoub, 22, who drove a van through a crowd of people on the popular Las Ramblas boulevard in the heart of Barcelona on August 17, 2017, killing 13 people. He then stabbed another man to make his getaway before being shot dead by police days later…. 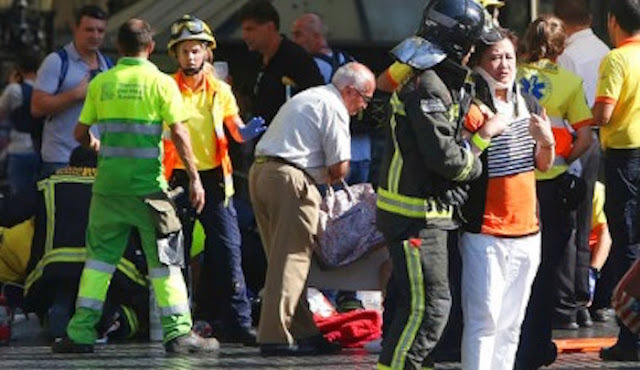 A total of 16 people were killed in the Barcelona assault and a knife attack in the nearby resort of Cambrils. The Islamic State group claimed responsibility for the attacks. La Razon also published transcripts of dialogue between the plotters, in which they make fun of their potential victims and brag about their upcoming attack. “Allah has chosen us from among millions of people to make you cry blood,” a man identified as Omar Hichamy is quoted as saying. The six youths of Moroccan origin, aged 17 to 24, who carried out the attacks were all killed by police. Moroccan iman [sic] Abdelbaki Es Satty, who is believed to have radicalised the others, was killed in the Alcanar explosion.